Like I said in my previous post, evening runs are hard to figure out. Plus I’m not in the greatest of shape right now due to my bouts of strep, but things worked out all right. After about a mile of warming up, I got up to the starting line. It felt good to be back in a race and to see so many familiar faces in the run. There wasn’t anyone I recognized as being super fast, John Richardson was there who typically runs around 18:20 or so was there, so I was a little concerned about him. One runner looked to be in high school, thin and wiry, he had the looks of a runner, he was definitely a concern… Immediately after the start, the kid took off. While his pace wasn’t unmatchable, it wasn’t something that I could maintain for a 5k, so I let him go and instead ran with John at a much more comfortable pace. slowly the kid began to pull away, I figured he’s either going to blow up and we’ll catch him, or he’ll keep up his pace and when by a minute or so… At the first mile, our time was 6:20… A little too slow, but boy this felt better than really pushing the pace! But, at this pace, we would be lucky to break 20 minutes so I decided I needed to push things a little. I took the lead and moved to the front, 12:20 at mile two, we had covered the second mile in 6:00. The only problem, while I had picked up the pace, John was right there on my feet… The kid was pretty much out of sight by this point, except on some long straight aways. With half a mile to go, John took the lead… This gave me a little chance to recover, but I was a little afraid he might start pulling away because I was hurting… But fortunately he didn’t, I was able to hang on. With about 500 meters to go or so, I kicked and John wasn’t able to go with… Final time of 18:20 with John 3 or 4 seconds behind. The Crit started at 9:30am and with a field limit of 50 in the Category 5 I decided I should get there fairly early. After leaving Columbia at 6am, I arrived at the race site around 8:20am. Registration went smoothly and I then went to Walmart to get a little something to snack on. Once I had my bike assembled, I took a couple of practice laps on the course and tried to figure out how the race would likely progress. The course consisted of around a 1/4 mile gradual hill right at the start of the race. The initial 100 meters of the hill was slightly steeper and then it leveled out to a gradual incline. At the top of the hill, there was a 90 degree left hand corner. This was followed by a flat stretch with another 90 degree left hand corner. From there to the finish it was pretty much downhill with one more 90 degree left hand corner about 200 meters from the finish. This final corner would be key as it would have to be taken at a high rate of speed in order to have a chance in the final sprint. There were around 40 racers lined up at the start. Two of the racers were decked out in Big Shark gear, and five of the racers were Team Mack… the rest were a smattering of racers, but they all looked intimidating to me. The format was 20 minutes, followed by 5 laps, after riding the course for 20 minutes, we would have 5 laps for all the marbles. My plan was to stick with the pack, hope no breaks get away, and see what happens in those last 5 laps. Things ended up working out ok! We made it through the 20 minutes without any wrecks and no successful breakaways. Two guys went off the front for a little while, but we kept them close and pulled them back eventually. I was feeling the effects of the previous nights 5k, but it seemed like I was going to be able to hang with them until the end. Finally, after 20 minutes and 4 laps, the bell lap sounded. I had been at the back of the pack, but was usually able to move up at will on the hill and despite a definite increase in the pace I moved up an by the top of the hill was sitting well in about 4th place. We came up to the next corner at a much higher rate of speed and the guy in front of me clipped his pedal and almost went down. This slowed me up for a second, but I managed to hold my position. Now we were going downhill and fast. A dogfish rider attacked and the two of the rider in front of me went after him, but the rider directly in front of me couldn’t react. So I picked up my pace and went around him. But in the meantime, a Big Shark rider in front counter-attacked. I caught the dogfish rider and we were to the corner, cornering at 30+ miles an hour, but I was around the corner a split second after the two lead guys and they were all ready starting their sprint. I ramped it up as much as I could, but at this point I was pretty much just solidifying a third place finish. I finished 3rd once before in a crit, back in 1989 as a 15 year old in a race with about 11 starters, this was something completely different and I was happy with the result, definitely ready for my next bike race! Well, the first race is out of the way, Froze Toes bike race two and a half weeks ago. Now its time for my first running race of the year. St. Patty’s 5k is this Friday evening at 5:30pm in Kirksville. After the long 13+ hour trip to New Orleans, we arrived at our motel around 2am. At this point we should have all gone to bed, but instead we headed down to Bourbon Street. Finally, around 4am we made it back to the motel room. So around 4am we all retired to the room and I was out like a light. The following morning Melissa, Kevin, and I went down to the continental breakfast for a light meal and then we went back upstairs and back to sleep. Finally around noon we got up and headed down to the race expo. After meandering around the race expo, I made my way back to the hotel. Melissa, Leslie, and Kevin had split off and headed down to the French Quarter. I planned to take the day easy and walking around New Orleans wasn’t on my pre-approved list of “easy”. I did feel that my legs could use a little activity so I changed into my running gear and did a brisk 3 mile run down Canal Street to the river and back. That evening when it came time to carbo load, I headed down to a mall where there was supposed to be a Sabbarro’s, turns out they were closed and since the other location I was aware of was over 2 miles away, I ended up settling for Quizno’s. I went with a mesquite chicken sub, probably better than a lot of options, but not the same as a nice big plate of pasta. Anyways, the sub was good and I ate it while watching Forest Gump in the motel room. Ok, I’m getting a little long winded here, gotta shorten things up a little. We got to the race site around 6:15; we had gotten up at 5am to get some fuel in the body. After checking in our gear, we all wished each other luck and then went are separate ways. The rest of the run was just a battle, trying to maintain some speed while suffering the effects of going anaerobic early on. From mile 5 until the end I had a headache, though from 5 through 10 it was at its worst. I seriously considered quitting, but then finally decided that finishing it out would be the best, treat it as a training run and maybe recover a little towards the end. When I finally saw the Super Dome, I was relieved. With less than one mile to go another runner passed me, I could tell he was trying to kick it in strong. My competitive spirit kicked back in and I stepped right in behind him. I followed him for about ¼ of a mile and then I passed him and finished 6 seconds ahead of him, my final mile was a 6:23. Time: 1:26:21 – 1:36 slower than my half marathon PR. So what went wrong? Had I gone out slower initially, I probably could have maintained a 6:20 pace and run a PR by over 2 minutes, but by going anaerobic early on I blew any chance I had at that. In addition, my pre-race nutrition wasn’t right; I ended up with gastrointestinal discomfort during the run. Finally, my sleeping the nights leading up to the race was poor with Friday night being the worst; it should have been the best night sleep in order to be ready for Sunday. Oh Tony, your focus is impelling. I can hardly wait for next year. I will, however, decide in favor of rest in the days before the race, I suffered through every mile. I walked a lot!! Seems quite reasonable that the entire lead up to the race was a flop. How often had you run at sustained 6:10-6:20 leading up to the race? In swimming there is a “critical speed” in which one must train to advance such outcomes. What is yours? Having run several marathons myself seeking a PR and staying out late, improper nutrition and poor race strategy are contradictory. Hi Tony….I have learnt a few things and even though I’m a novice at this competitive running thing (I know, I know, I’ll never be competitive)I’d offer one nugget of advice if you want to get more consistent and faster…..ditch the processed sugar till after the race….no pop tarts or honey before the race…..insulin isn’t good for speed…. 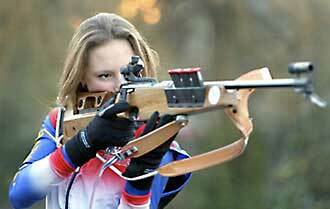 I want to be a biathlete! “Imagine skiing around a turn at twenty miles per hour with a rifle harnessed on your back. Out of breath; your heart pounds in your chest as you ski up to a rifle firing point. Quickly pulling the rifle around from your back, you settle with the first target in sight. Better calm your nerves quickly to knock down the targets; the clock is running. Yep, biathletes have it figured out. I bet they don’t have problems with people driving by and hollering at them while they’re out training. Imagine the new found respect motorists would have if we started biking with rifles straped to our backs. They can wear what ever clothes they want, who’s going to make fun of an expert marksmen with a rifle strapped to their back?